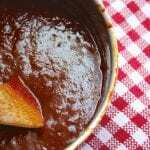 A homemade bbq sauce that rivals the South using real food. Dice onion. Warm oil in a med sauce pan. Sauté onion until soft and translucent. Peel and crush garlic. Add to onion and sauté for a few minutes making sure not to burn garlic. Add tomato sauce, tomato paste, molasses, brown sugar, vinegar, worcestershire, liquid smoke and soy sauce. Stir until combined. Add spices and stir well. Cook over low heat until desired thickness, approximately 10-15 mins, stirring frequently. Taste and adjust seasoning for desired flavor making sure to add additional flavors in small batches if needed. For an extra thick sauce, substitute tomato sauce for tomato paste. Cans and jars will run from 6-8 oz and will still work well for recipe.